Price For: Each Gauge: 16 Back Splash: Yes Includes: 1-5/8" Galvanized Legs and AB1953 Faucet Number of Holes: 3 Item: Utility Sink Mounting Type: Floor Material: Stainless Steel With Faucet/Without Faucet: With Faucet Color: Stainless Faucet Mounting Centers: 8" Drain Opening: 1-1/2" Bowl Size: 18" x 21" Side Splash: No No. of Bowls: 1 Overall Width: 25"
If you have any questions about this product by Eagle Group, contact us by completing and submitting the form below. If you are looking for a specif part number, please include it with your message. 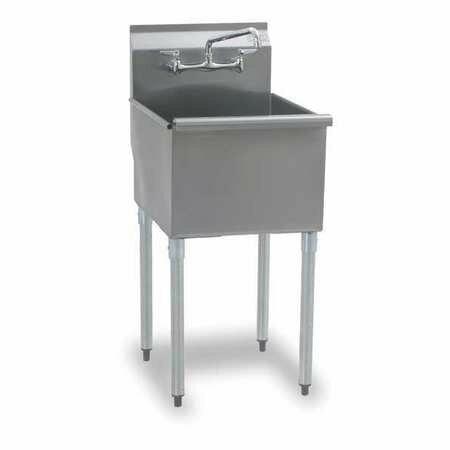 Single Fabricated Bowl Scullery Sink Width: 45"